The Japan Sports Arbitration Agency (JSAA) is the dispute resolution body in Japan, which provides arbitration and mediation procedures for sport-related disputes. In Japan, as sports attract rising attention in light of hosting of the 2019 Rugby World Cup and the 2020 Tokyo Olympic and Paralympic Games, sport-related disputes are occurring more frequently. Thus, the JSAA is now expected to play an important role in resolving and preventing sport-related disputes in Japan. describes the JSAA's future challenges. In Japan, from around 1998, in response to the movement to strengthen international regulations on doping, and in the absence of any independent authority specialized in doping disputes, the idea of creating an arbitration body for doping disputes was discussed. In 2000, although a selection dispute is a domestic case between Japanese Swimmer and Japanese Sports Federation, the dispute has to be resolved by the Court of Arbitration for Sport (CAS) (Suzu Chiba v/ Japan Amateur Swimming Federation1) and the athlete has to pay much translation cost for the resolution because the official language of CAS is English and French. If there were a domestic sport arbitration court in Japan, the athlete wouldn’t have to pay such a much cost. Then, based on the report of the research group on sports arbitration in the Japanese Olympic Committee (JOC), JSAA was established in 2003 with the support of the JOC, the Japan Para Sport Association (JPSA), and the Japan Sport Association. Since its creation, the JSAA has settled sport-related disputes in Japan through arbitration and mediation procedures. JSAA’s arbitration procedures include (i) appeal arbitration procedures and (ii) doping arbitration procedures. According to annual report of JSAA in 2017/2018, 73 claims have been registered for appeal, 6 for doping, and 7 for mediation procedures (as of 31st March 2018, see table below) since its creation. The JSAA also conducts research on good governance for sports federations. Based on this research, the JSAA has issued research papers and guidebook on its website. These help sports federations in Japan to improve their governance. Since 2003, the regulation of appeal arbitration procedures (the Appeal Arbitration Regulation) has governed sports-related disputes for appeal to decisions taken by the internal bodies of sports federations. The main characteristics of the Appeal Arbitration Regulation are as follows. Inexpensive Appeal Procedures - for disputes resulting from decisions taken by the internal bodies of sports federations, the Appeal Arbitration Regulation is applicable. The cost of the appeal arbitration procedure is a fixed amount of 54,000 yen (approximately 500 USD). This makes the appeal arbitration procedure more athlete-friendly. Speed of Procedures - Sport-related disputes require prompt resolutions. The average time period from the filing to the rendering of the arbitral award in appeal arbitration proceedings is about five (5) months. Furthermore, when the JSAA determines that the dispute needs to be resolved promptly due to the nature of the case, the case will be assigned to an expedited process. In the case of the expedited processing, the average period from the filing to the rendering of an arbitral award is approximately three (3) weeks. Closed List of Arbitrators - In principle, the arbitrators shall be nominated or selected from the list of arbitrators. The arbitrator candidates are attorneys or scholars who are familiar with sports law and sports arbitration, recommended by sports federations or current arbitrators. Transparency of Arbitral Awards - Although the procedure of the arbitration is undisclosed, the JSAA has published all arbitral awards on its website (in Japanese), with athletes names anonymized. Thus, anyone can confirm and refer to all of arbitral awards rendered by the JSAA arbitral panels. This helps considerably to establish lex sportiva (sports law) and prevent sport-related disputes in Japan. Of the 73 appeal cases, decisions were made in 45 of the cases (as of 31st March 2018) and the other 28 claims were withdrawn. Six decisions have been made in doping cases. Selection Dispute (19 Cases) - Selection disputes are disputes over a decision by sports federations not to select athletes for national or international competitions. Among the nineteen (19) selection disputes (See Annex 1), twelve (12) have been assigned to an expedited procedure. In a selection dispute, the existence and reasonableness of the selection criteria or the reasonableness of the application of these criteria are points of dispute. According to past jurisprudences in JSAA, arbitral panels tend to defer to the discretion of sports federations. Thus, selection decisions of sports federations tend to be maintained. Disciplinary Dispute (19 Cases) - Disciplinary disputes are disputes over sanctions rendered to athletes or athlete support personals on the grounds that they are in violation of regulations or requirements established by sports federations. In this type of disputes, whether or not they violate these regulations, the proportionality of the sanction, and due process of the sanction are points of dispute. There have been 19 disciplinary cases in the JSAA (See Annex 2). The JSAA has revoked a decision of sports federations from the viewpoint of the proportionality or due process of the decision. Doping Dispute (6 Cases) - JSAA deals with appeals against decisions made by the Japan Anti-Doping Disciplinary Panel pursuant to Article 8.5 of the Japan Anti-Doping Code (JADC). There have been six (6) doping cases in the JSAA (See Annex 3). In these cases, whether an athlete violates Article 2 of the JADC or the length of the period of ineligibility were points of dispute. Contract Dispute – 2 Cases - Contract disputes are disputes over the contractual status between claimants and respondents, non-performance of contractual obligations or the validity of the termination of contracts. Two (2) contract disputes have occurred in the JSAA. These both related to disputes over the validity of the termination of a coach’s contract by a sports federation (JSAA-AP-2014-008 and JSAA-AP-2015-002). Eligibility Dispute (2 Cases) - Eligibility disputes are disputes over whether or not a claimant is qualified in a sports federation or a competition. There are two (2) eligibility cases that have occurred in the JSAA. One is a dispute over the eligibility of an official referee admitted by a sports federation (JSAA-AP-2009-002). The other is a dispute over the eligibility of an official member of a sports federation (JSAA-AP-2015-004). Others (3 Cases) - There are three (3) other cases. These are a dispute over the number of staff dispatched to the Olympic Games (JSAA-AP-2003-002); a dispute over failure of a national federation to supervise an affiliate federation (JSAA-AP-2011-002); and a dispute over the validity of resolution of directors meeting on selecting new board members (JSAA-AP-2012-003). Since 2006, the Regulation of Sports-Related Mediation has governed the mediation procedures of the JSAA. Mediation in the JSAA is a non-binding procedure to negotiate with the other party with the assistance of a JSAA mediator, with a view to settling a sports-related dispute. The total number of petitions for mediation procedures is 17. However, in 10 cases, the procedures terminated because respondents refused to conclude mediation agreements. The JSAA celebrates its 16th anniversary this year. 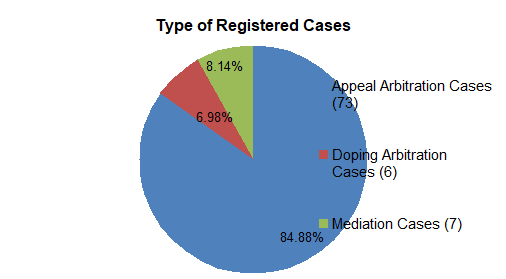 The number of cases pending for the JSAA arbitration and mediation continues to increase. However, there are some challenges to overcome for the JSAA as it continues to mature into a sophisticated dispute resolution body. Firstly, not all member federations of the JOC and the JPSA have recognized the jurisdiction of the JSAA and included in their statutes an arbitration clause referring disputes to the JSAA. 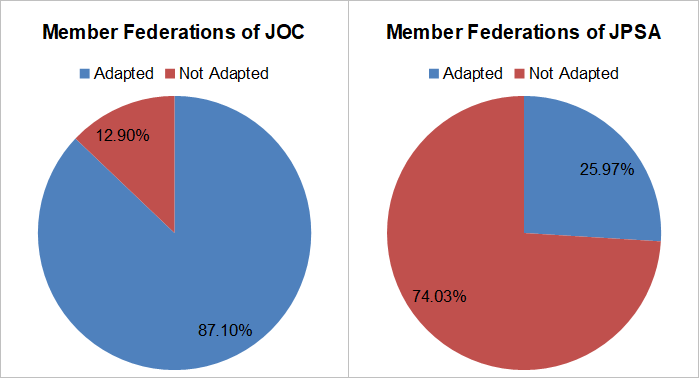 According to the chart published by JSAA, the percentage of member federations of JOC adopting the arbitration clause is 87% (as of 31st March 2018). The percentage of the JPSA is still 26%. It is expected that all member federations of the JOC and the JPSA will adopt the arbitration clause in their statutes for their athletes to ensure the right to appeal. Secondly, although the number of arbitrator candidates is approximately 170 (as of 31st March 2018), not all of them have arbitration experienced. In order for the JSAA to keep rendering credible arbitral awards both for athletes and sports federations, the JSAA should educate and promote its non-experienced arbitrators by holding training sessions or symposiums for them. Thirdly, during the 2020 Tokyo Olympics Games, the CAS Ad-hoc Division and Anti-Doping Division will be temporarily established in Tokyo. Like Sport Resolutions in the 2012 London Olympic Games, the JSAA is expected to play a role in organizing a pro-bono lawyers’ representation service for athletes and officials of National Olympic Committees visiting Tokyo. By preparing and training for CAS’s Olympic Divisions, the number of experienced sport arbitration lawyers in Japan will increase. This legacy will help JSAA in preventing and resolving sport-related disputes in Japan long after the conclusion of the Games. The JSAA is expected to overcome these challenges in order to scale up its position as the only national dispute resolution body for protecting integrity of sports.